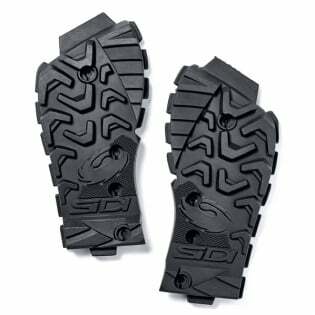 The Sidi Crossfire 3 SRS Enduro Soles are replacement boot soles which have been specially created so as to offer you a more secure footing. The rugged design makes these boot soles ideal for uneven and slippery surfaces, whilst also preventing slipping on the screws that secure them to the bottom of the boot. Designed to withstand wear and tear exceptionally well, easily replaceable and compatible with Sidi Crossfire 3 SRS Boots.